Can you imagine seeing it? After all of this time, after generations of promises, after the leading of God’s people through one of the most trying seasons in history, and after a lifelong test of leadership that was mixed with some significant failures, Moses stands and sees the land of promise. Moses is not allowed to enter this land due to his disobedience to the Lord in one particular instance. Yet Moses has accepted his fate from the Lord. Moses had asked the Lord, in an earlier exchange, to change His mind by allowing him into the land. Yet, God said no. And what is interesting here is that Moses is said to be “as strong as ever.” Moses had life left, he had strength left, he could see, he was able to enter into the land if God had so desired. But God had different plans for him. We face these situations in our lives. We want something, we want to keep going, we feel we are able to handle it, we ask God, and we see no reason that we should not receive what we asked; yet God has different plans. And in those moments the true question is, will we remain faithful? Moses didn’t get what he wanted, or what we may think he deserved, yet he stayed faithful until the end. He blessed Joshua to take his place, he spent a long time recapping all that God had done and reiterating God’s commands, and now he is content with his fate. Will you fight for godly contentment in the midst of your circumstances? Ultimately, Moses had one great run. Never had a prophet known God face to face like Moses had. And Moses didn’t let a bitter ending ruin a better run. He was faithful until the end. As a city boy and somewhat hipster (not the elitist skinny jeans type hipster but in the sense that I get annoyed by anything that becomes mainstream and everyone else just drinks the Kool-Aid type hipster) I didn’t give Duck Dynasty a chance when it first started picking up steam 2 years ago. Students would tell me they’re hilarious and sarcastic, country people would tell me they’re good ol’ boys with great values, Christians would tell me they’re umm… Christian and they all would try to get me to watch the Robertson family on a weekly basis. Even my wife told me I’d really like it if I actually gave it a chance. I’d read brief episode recaps online to know what others were talking about (as a good missionary should) but I wouldn’t give in until one day I was reading up on the bio of Phil Robertson. I found his story intriguing as a former college QB standout and the life he chose in spite of his athletic abilities. This led to my first viewing of Duck Dynasty and I am not ashamed to say that everyone was right because I loved it. I loved it then and I love it still today. I loved it for all of the reasons listed above but more then anything I loved it because it shows a beautiful picture of what we see in today’s reading in Deuteronomy 33. In today’s devotion we see Moses, a type of patriarch for Israel, blessing his sons before his death and reminding them who God is and what He will do with their families and His people if they God first. He talks about God’s love, justice and protection in this chapter and he knows that he will not be with them as they continue to the Promised Land but that God will be faithful to what he is passing down. 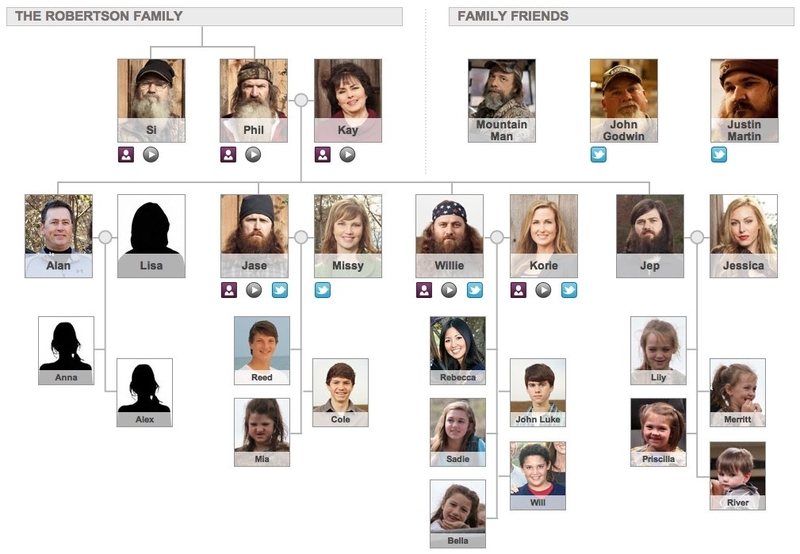 Phil Robertson is regularly called the patriarch of the Robertson family and as unpopular as that term can be in today’s culture, you can see through this picture of their family tree that him and his wife have raised up four sons who love Jesus and then got married to women who love Jesus and then raised up kids in a home where Jesus was at that center. Just staring at that picture and thinking about the legacy this family is leaving gives me the utmost of joy and hope. We’d be stupid to put these people up on a pedestal and just like any other Christian family this is not a promised that every kid will become a Christian and live their life for Jesus. But you can’t argue that God’s blessing for the family is being shown in the Robertsons as you see four sons of Phil who are leaders in their church and grandkids of Phil starting modest clothing lines and giving glory to God in all they do. Let this be an encouragement to you today that men who sacrificially love and lead the home can start or continue that same family tree that Moses and Phil has exemplified and if you’re a husband/father how are you doing that today? I recently had an opportunity to share the gospel with a lady who was struggling with depression and anxiety. She claimed to be a Christian so when she came in for a counseling appointment the first question that I asked her was, “how would you explain the gospel to someone else?” She could eloquently share the gospel of Jesus Christ, maybe better than most Christians. My second question was “do you believe that?” Unfortunately, for this young lady she came to the conclusion that she does not believe it. As I began to work through the idols of her heart and show her the truth about her current situation (Ephesians 2:1-3) she became broken. She admitted that she feels dead inside. As we talked further about the truth of the gospel and God’s desire to restore her back into a relationship with Him. She understood and liked the thought of it. So what was holding this young lady back? She just couldn’t bear the thought of giving up her idols. When I studied through today’s passage I was gripped by vs. 1-14. God reminds us of His perfect work and his perfect faithfulness. God took his people out of the desert and chose Jacob (Israel) as His own. God guided them and protected them just as an eagle takes care of its young. I am reminded of how great and powerful of a God we really serve. God is the rock of our salvation that can never be moved and I am thankful that God’s children can trust in His perfect faithfulness. However, I am broken by vs.15-18 because our hearts are worshipping hearts that because of our sin desires to worship false gods. Idol worship is simply putting something or someone in the place that God should rightfully hold. Why do we trust in things other than God? Why do we seek false idols? The truth is that the worship of an idol is not about the idol itself but about what the idol promises in proximity to our desired reality. For example, if I desire to be comfortable I may worship the idol of success and money because it promises to afford me the ability to reach the comfort level that I desire. Idol worship is truly about building one’s own kingdom to satisfy one’s own foolish pride. “But Jeshurun grew fat, and kicked; you grew fat, stout, and sleek; then he forsook God who made him and scoffed at the Rock of his salvation. How strong is your faith today? Is God the Rock of your salvation or have you began to turn to other idols to provide your desired reality? No doubt that this torch was passed because of the faithfulness of Nun, and most definitely because of Moses. You never know who you will impact. Moses, who was as unqualified as anyone, ended up leading a nation out of slavery. It wasn’t on his own though. God gave him an incredible heritage. People invested in him. He was shaped and mentored. NEVER UNDERESTIMATE THE IMPACT YOU CAN HAVE ON ONE LIFE. Have you ever asked yourself, “What could I possibly do that matters?” You are not alone. I have asked myself that question more than once. Let me introduce you to seven people who were ALL influenced by another person. It all started with a guy from Boston. EDWARD KIMBALL led a small group at his church when he met a challenging teenager. That seventeen-year-old young man was poorly educated and prone to outbursts of anger and profanity. DWIGHT L. MOODY. He became the “greatest” evangelist of the nineteenth century. He was instrumental in the life-change experienced by a young man. F.B. MEYER. He became a minister. He mentored a young man. J.W. CHAPMAN. He became a pastor and evangelist. He also started an outreach to professional baseball players. There he influenced a young man. BILLY SUNDAY. He became one of the greatest evangelists in the first two decades of the twentieth century. He influenced a young man who eventually came back to work with him. BILLY GRAHAM. He has influenced more people than any other preacher in history. He remains a trusted confidant to presidents and other key influencers. Do the best you can where you are, with what you have, for a purpose that is greater than yourself. You can be someone worthwhile. You can do something that matters.